Zombie food Halloween candy, chocolate brains, hearts and feet filled with a blood red caramel. What kid would not want to bite into a chocolate brain and find a red caramel center making it look just like blood? 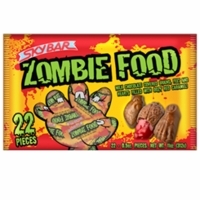 Every zombie will be thrilled with sky bar zombie food candy. It is great to hand out for trick or treat, use for Halloween party favors or just to eat.